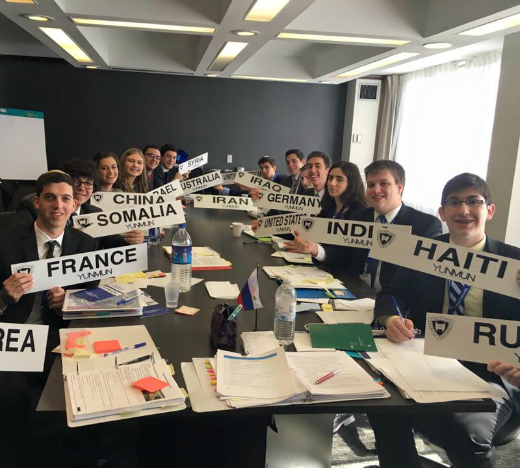 From February 11−13, over 400 student delegates from 47 yeshiva high schools and community day schools in three countries will gather at the Crowne Plaza Hotel and Conference Center in Stamford, Connecticut, to participate in the 28th annual Yeshiva University National Model United Nations conference (YUNMUN). Simulating the countries and committees from the real United Nations, the student delegates will learn about the complexities of international diplomacy while discussing a wide range of issues, including gender roles, human rights and international law. More than 75 YU undergraduate students will be on hand at the event to assist high school groups from Brazil, Canada and cities across the U.S. and coordinate the multi-tiered program. In preparation for the event, students have been assigned countries and appointed to one of 15 committees dealing with issues of international concern, including the Commission on the Status of Women, the Counterterrorism Committee, the International Criminal Court, the Middle East Summit, and the United Nations Human Rights Committee. To argue their points effectively, students have been conducting extensive research to ensure that their countries’ interests and policies will be faithfully represented. The conference will also feature a keynote address by Israeli activist attorney Nitsana Darshan-Leitner, the founder of Shurat HaDin – Israel Law Center, who will educate the student delegates about the use of legal action to fight terrorism and safeguard Jewish rights around the world. Darshan-Leitner has dedicated her life to utilizing international court systems to defend Israel and Jewish interests against lawsuits, fight academic and economic boycotts, and challenge those who seek to delegitimize the Jewish State. Under her direction, Shurat HaDin works with Western intelligence agencies, law enforcement branches and a network of volunteer lawyers across the globe to file legal actions on behalf of terror victims. The YUNMUN closing ceremonies will include the presentation of awards to the best delegates and honorable mentions on each UN committee as well as remarks from Yeshiva University President Rabbi Dr. Ari Berman.